In South Korea, Parent's Day (Korean: 어버이날 Eobeoinal) is annually held on May 8. Parent's Day is celebrated by both the public and the government. 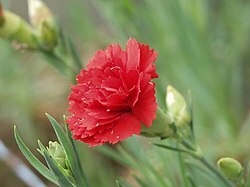 Family events focus on the parents; popular actions include giving parents carnations. Public events are led by the Ministry of Health and Welfare and include public celebrations and awards. The origins of Parent's Day can be traced back to the 1930s. Starting in 1930, some Christian communities began to celebrate Mother's Day or Parents' Day. This tradition was combined with Korea's traditional Confucianism culture to eventually establish Mother's Day. In 1956, the State Council of South Korea designated May 8 as an annual Mother's Day. However, the question of Father's Day was discussed and on March 30, 1973, May 8 was designated as Parents' Day under Presidential Decree 6615, or the Regulations Concerning Various Holidays (각종 기념일 등에 관한 규정). When Parents' Day was first established, the entire week with the 8th day was designated to be a week to respect the elderly, but respecting elders in the month of May was abolished in 1997 with October becoming the month designated for respecting the elderly. Mothers' Day is traditionally celebrated on the first Monday of December. On this day, children placed pink cadena de amor on their chest. Children who no longer have mothers place white cadena de amor. In 1921, Circular No. 33 designating the first Monday every December as Mothers' day was issued, as a response to the appeal Ilocos Norte Federation of Woman's Clubs. During the Philippine Commonwealth Government, then President Quezon issued Proclamation No. 213, s. 1937 declaring the day designated as Mothers' Day as Parents' Day. This was due to finding petitions to set a special date for Fathers’ Day not advisable as there are already set of numerous holidays set, and deeming it more fitting to celebrate both Mothers' and Fathers' Day together and not apart. In 1980, a proclamation was issued declaring first Sunday and the first Monday of December as Father's Day and Mother's Day respectively. In 1988, the issued presidential proclamation followed the international day of celebration of Father's and Mother's Day which most Filipinos are familiar with. However, then President Estrada tried to revive the tradition through Proclamation No. 58, s. 1998. ^ "The first Monday of December is Mother's Day and Father's Day". Malacañan Palace Presidential Museum and Library. ^ "Global Day of Parents". United Nations. Retrieved 6 June 2014. ^ Anderson, Eloise (22 July 2018). "Helping parents work, so children can succeed". Dunn County News. Wisconsin. Retrieved 22 July 2018. ^ Mobile Register staff (July 30, 2000). "Parents Day shows links of Moon's church to GOP". Mobile Register. p. A9. ^ "Parents` day by Korean Nation Culture Encyclopedia". Korean Nation Culture Encyclopedia(http://encykorea.aks.ac.kr). ^ a b c 어버이날 [Parents' Day]. 한국세시풍속사전 (in Korean). National Folk Museum of Korea. Retrieved May 5, 2014. ^ a b 어버이날 [Parents' Day]. Doopedia (in Korean). Doosan Corporation. Retrieved May 5, 2014. ^ 어버이날 [Parents' Day]. Encyclopedia of Korean culture (in Korean). Academy of Korean Studies.